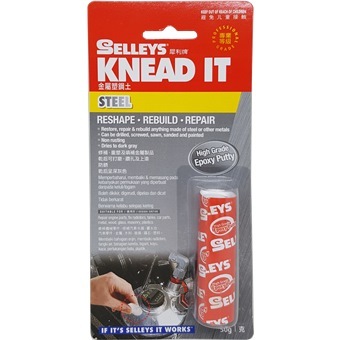 Knead It Steel Exproxy putty is a fast-setting, industrial-strength polymer compound that enables permanent repairs to anything made of steel or other metals. The modelling-clay like material eliminates drips and runs, facilitates adhesion to the substrate and allows the material to be shaped and formed as needed before curing begins. Once cured, it can be drilled, screwed, sawn, sanded, or painted.